A midwife nurse intern works with a young client at Jowzjan Civilian Hospital in Mazar-i-Sharif, Afghanistan. Photo courtesy of DAI. Female clients often want care from female health workers, but they're in short supply. 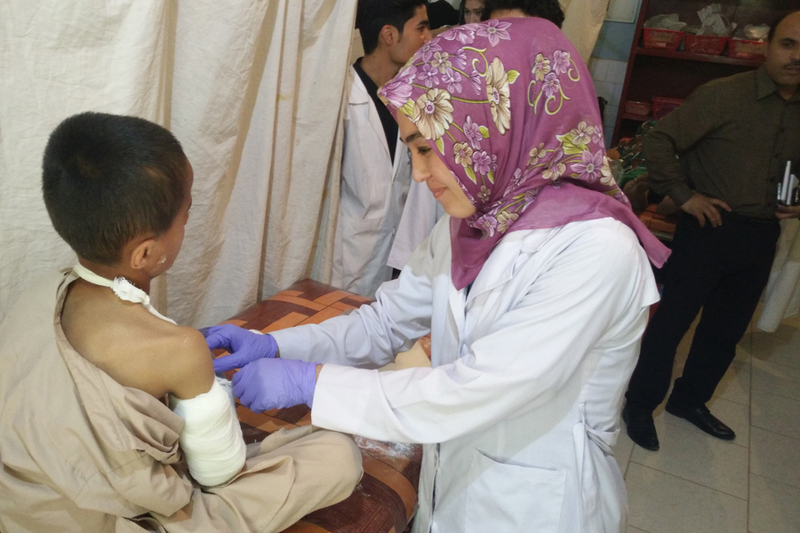 Communities across Afghanistan—especially the dispersed populations in rural areas—have long endured a lack of basic health services due to low numbers of trained health workers and chronic security issues. But this situation is improving. Today, a program to bolster women’s inclusion in Afghanistan’s mainstream economy is also serving to fill high-priority needs in maternal and infant care, vaccination, skilled nursing, and other health services. There is a huge demand for skilled female medical staff. Health internships and apprenticeships: Implemented by 24 job placement officers and managers across Afghanistan, the WIE Internship and Apprenticeship program’s network of 1,600 vetted employers provides safe working conditions for young women who are often entering the professional workplace for the first time. WIE has facilitated more than 1,700 internships and apprenticeships in the health sector alone. Forward Together Scholarships: Of the 4,380 women earning these cost-share scholarships, 534 have completed or are enrolled in medical technology skills development courses, with 310 attaining full-time jobs and another 35 securing internships. WIE’s pre-vetted training providers teach courses in ultrasound, emergency obstetrics, pharmacy, mammography, and more than 10 other specialties. In Afghanistan as elsewhere, cultural norms require that only women may provide health care to other women, especially during intimate circumstances such as pregnancy and childbirth. Yet these countries often present complex and challenging environments that restrict women’s access to training, leading to low numbers of midwives, nurses, and female community health workers, especially in rural locales. Hence, women and girls go untreated. In Afghanistan, this shortage has resulted in high rates of maternal, child, and infant mortality. Before, female patients in need of care would cancel appointments. Due to cultural and safety concerns, women and girls in Kandahar province struggle to locate acceptable dental and health care. When WIE introduced a basic dentistry training course, 13 women enrolled and 11 graduates found jobs, becoming among the first female dental practitioners in Kandahar. Laila became the first woman to work as a dental assistant in the Ahmadi Dental Clinic, prompting her employer to promote dental care for female patients. Since hiring Laila, the clinic’s roster of female patients has steadily increased. Read more at DAI Developments. This post originally appeared in full on DAI Developments.